On the campaign trail in 2008, Barack Obama promised to fundamentally transform the United States of America. After nearly eight years as president, he has delivered on one front by reshaping the federal judiciary. That revolution has been comprehensive, dramatic, and under the radar. When Obama entered the Oval Office, liberal judges controlled just one of the 13 circuits of the U.S. Court of Appeals. Fifty-five successful presidential nominations later, liberal majorities now control nine of those appeals benches, or 70 percent. Outside of legal circles the transformation of the influential federal appeals courts has gone largely unnoticed, though. Obama also has left his mark on the U.S. District Courts, which are the lower federal courts, successfully appointing 268 judges—seven more than President George W. Bush. Obama didn’t push federal courts to the left by himself, though, since the Senate must confirm a president’s judicial appointments. And some conservatives complain that Senate Republicans handed over the keys to the judiciary without a fight. “These nominees can’t be characterized as anything but radical liberals, and the senators knew that when they were voting,” said Ken Cuccinelli, a former attorney general of Virginia who is now president of the Senate Conservatives Fund, a political action committee. While there’s “no singular explanation” for how the majority of federal appeals judges flipped, Cuccinelli told The Daily Signal, Senate Republicans have adopted a strategy of “knee-jerk surrender” on nominees. Republican leadership balks at that characterization, arguing that they’ve spent most of their time engaging in guerilla-style campaigns against an entrenched, determined Democrat majority. “A Democrat president has been in office for eight years, most of that with a Democrat Senate, including several years of a filibuster-proof Democratic majority,” a spokesman for Majority Leader Mitch McConnell told The Daily Signal. While Republican opposition to Obama’s Supreme Court nominee, Merrick Garland, has remained consistent in the Senate, the strategy for appeals court nominees has fluctuated. Liberals describe it as aggressive, but conservatives belittle it as reserved. There’s a decent case to be made for both interpretations. 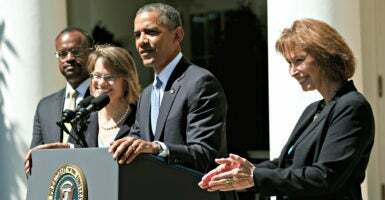 A Republican minority in the Senate filibustered for months in 2013 to keep three Obama nominees—Patricia Ann Millett, Cornelia Pillard, and Robert Leon Wilkins—off the U.S. Court of Appeals for the District of Columbia. To overcome Republican opposition at the time, under the Democrats’ new rules federal judicial nominees can advance to a confirmation vote with the support of a simple majority of senators and without the threat of a filibuster. As a result, if a party holds the White House and a Senate majority, the president’s nominees are almost guaranteed confirmation. But Republican antagonism to Obama’s nominees has not been constant. 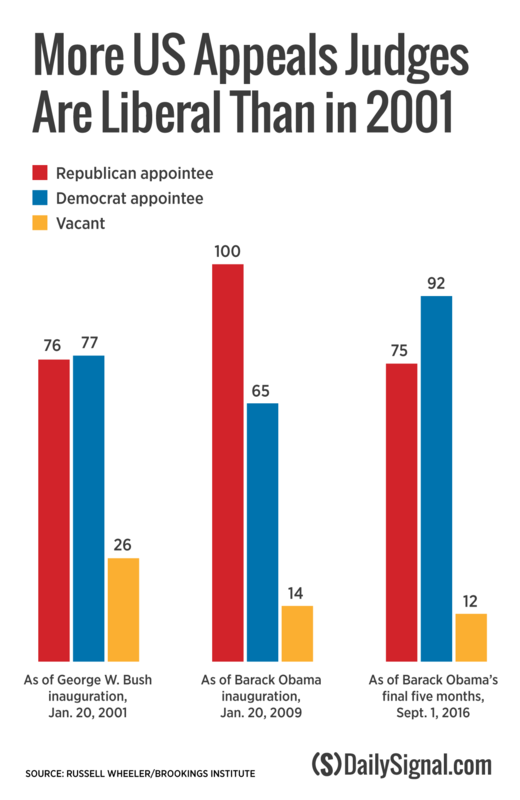 While in the minority, Republicans often mounted little to no opposition to Obama’s court of appeals nominees. And since winning the Senate majority in the 2014 elections, Republicans have rubber-stamped two appeals justices—Kara Stoll for the Federal Circuit and Luis Restrepo for the 3rd Circuit. As a result, Obama has fleshed out the judicial roster on the U.S. Court of Appeals, successfully appointing 55 of the 179 judges with little opposition. Seven more of Obama’s appeals court nominees await consideration in the Senate. With a compressed congressional calendar and Election Day on Nov. 8, however, more confirmations before Obama leaves office seem unlikely. The ideological makeup of the appeals court has more to do with justices retiring and dying off—“the natural process of attrition”—than politics, said Carrie Severino, chief counsel for Judicial Crisis Network, a conservative legal group. In April, that appeals court ruled 2-1 in favor of a transgender student’s right to use the boys’ restrooms and showers in public school. Two Obama appointees, Judges Henry Franklin Floyd and Andre Davis, outvoted Ronald Reagan appointee Paul Niemeyer. The Senate had confirmed both overwhelmingly and without significant Republican hindrance—Davis in 2009 by a vote of 72-16 and Floyd in 2011 by a vote of 96-0. The next president could tip the balance of the four remaining circuit courts of appeals still dominated by conservatives. 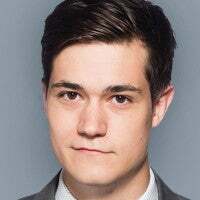 “It’s hands down the most fateful issue of the election,” said Willett, who is on Republicans’ short list for the Supreme Court.